Bunions can be a source of ongoing pain and swelling that can affect your ability to walk and perform your daily routine. If you have a bunion, then your foot specialist may recommend that you undergo bunion removal. Continue reading to learn how to prepare for bunion surgery in Sugar Land . Before the day of your surgery, your doctor may have you do some pre-admission testing (PAT) to ensure that you are physically and medically fit for surgery. While the nature of these tests can vary, they usually involve the taking of blood samples. Non-invasive heart examinations, physical examinations, and chest x-rays are other examples of PAT. As with many other surgical procedures, you may be advised to quit smoking in the time leading up to your surgery and during your recovery. Nicotine, along with other chemicals contained in cigarettes, can increase your risk for experiencing problems after your bunionectomy. The use of nicotine can slow blood flow to the leg and potentially increase your risk of blood clots and deep vein thrombosis, impede the healing of soft tissue and bone at the surgical site, and increase the chances of infection after surgery. To help ensure the best results from your bunion removal, it’s best not to use any products that contain nicotine before the procedure. Discuss your options for quitting smoking with your surgeon or primary care physician. To promote better healing, your surgeon may advise you to avoid putting weight on your foot after your bunionectomy. To help with this, you may be provided with a list of devices, such as crutches, shower chairs, or walkers, to purchase before and use after your surgery. It’s important to have as little contents in your stomach at the time of your surgery as possible. For this reason, your doctor will tell you to stop eating and drinking at some point before your appointment, with midnight the night before being typical. Finally, your surgeon may have you avoid certain medications before your surgery. A bunion can cause significant pain and discomfort, and one can even make it difficult for you to walk, if not addressed. If you visit a foot specialist for bunion treatment in Sugar Land, then he may recommend surgery if you’re experiencing trouble walking or toe stiffness and if non-surgical treatments have failed to provide you with relief. Watch this video to learn about the basics of bunion surgery. Bunions develop when the big toe’s metatarsal bone shifts towards the second toe and results in a bump inside the big toe’s first joint. During the procedure, you may be provided with oral or I.V. sedation and local anesthetic. Your foot will be numbed, and the surgical site will be prepared. To complete the procedure, your surgeon will cut or file away the bunion before suturing the incision closed. During a bunionectomy, your foot doctor will remove the portion of the metatarsal head that is protruding to reduce the foot pain and pressure you are experiencing. The procedure is usually performed under regional anesthesia on an outpatient basis, so you will return home the same day as your surgery. The recovery process can be lengthy and last from six weeks to as long as a year in some cases, depending on how invasive the procedure was and how severe your condition was before surgery. If you are scheduled for bunion surgery in Sugar Land , here is a look at what you can expect during the recovery. After bunion surgery, you will have stitches at the site of the incision. They must be kept dry at all times and will need to be covered when you are showering or bathing. In most cases, your foot doctor can remove the stitches in seven to 21 days after the procedure. In some cases, you may also have pins in your foot that stick out. These are put in place to keep your bones in the proper position for healing. Pins stay in place for longer than stitches and are removed between three and six weeks after surgery. After some bunionectomies, patients are not allowed to put any weight on their foot for six to eight weeks after surgery. Then, only partial weight bearing is allowed for a few more weeks after that before returning to normal walking. If your doctor doesn’t want you to put weight on your foot, he or she will prescribe crutches or another mobility device as needed. After your bunion surgery, you will not be able to wear your normal shoes for a period that can last anywhere from four weeks to four months. During this time, you may wear a walking cast, splint, wooden shoes, or other special shoes designed to support your healing. Your doctor will advise you when you can return to wearing your normal shoes based on how quickly you are healing. 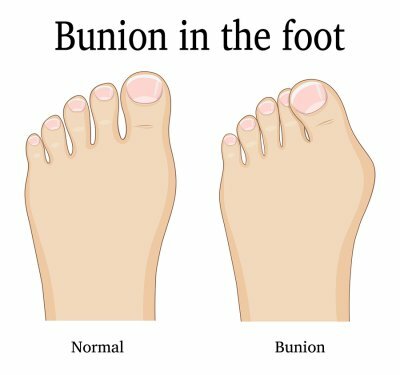 Bunions—bony protrusions that appear at the base of the big toe—can be extremely painful and may interfere with your mobility. If you suffer from bunions, your foot doctor in Sugar Land may recommend a range of treatments , from changing your shoes to bunion surgery . Watch this video to learn more about bunion treatment options. Depending on the severity of the bunion, conservative treatments, including wearing shoes with wider toe boxes and putting silicone pads on the bunion, can help. For more severe cases, bunion removal surgery may be necessary. Often, bunions can be prevented completely by wearing shoes that don’t squeeze your toes. If you do develop a bunion, beginning treatment as soon as possible may reduce the need for bunion surgery.